Marina's Kitchen Table: Praying for Missions - Part 3 - Those Who GO and Need Our Prayers! 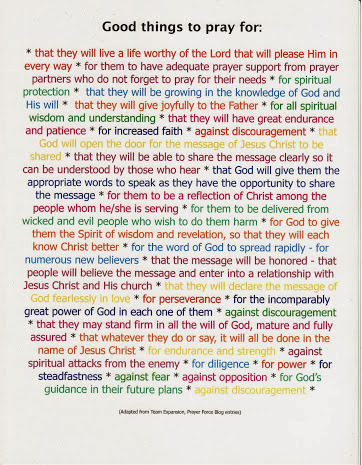 Praying for Missions - Part 3 - Those Who GO and Need Our Prayers! When our friends and loved ones leave for the field, we are often thinking about them... and moved to pray for them. Sometimes my prayers feel rote, repetitive, and not very powerful or effective. I got signed up for Team Expansion's Prayer Force and noticed how Betty Byrd led the short daily prayers so wonderfully. Even though they were just a few lines each, I felt power being released for the missionaries I was praying for! With her permission, I began to go through the prayers that fell under the heading "For any missionary, with any agency, anywhere in the world..." and compiled the above list. I printed it on cardstock and passed it out at presentations for friends as they presented their missions requests. I prayed it for my kids, my friends, my friends' kids! It's specific and powerful to hit on the topics she touches, and they are EFFECTIVE prayers. I don't know anyone who wouldn't want to have these prayers prayed over them! I suggest you sign up for Team Expansion's Prayer Force blog, and also check out their other prayer resources available online for FREE! One effective way to pray for our missionary friends/family members is to pray for the unreached people that they are reaching out to. You can pray through the resources available at JoshuaProject.net or be inspired through the meditations over at Unleashed for the Unreached, and please, pray as God leads you to. Lord, I pray that you would make us effective pray-ers. Help our minds think outside the box, and into the streets and life that our missionary friend/family member is living. I pray that you will bring other consistent prayer partners to their ministries, and help us to join in together to pray on their behalf. Teach us to pray Lord, over and over, for all their needs. Help us to be sensitive to the Holy Spirit's prompting to pray as YOU need us to! Let us hear Your still, small, voice, and not consider any prayer need too small OR too large! Let us be led by You! We love You, and desire that Your Name will be glorified through all the earth!